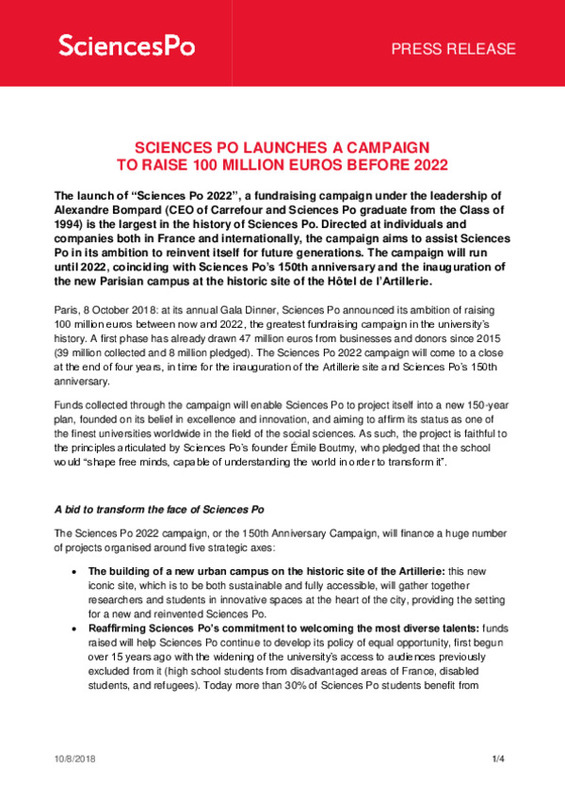 The launch of “Sciences Po 2022”, a fundraising campaign under the leadership of Alexandre Bompard (CEO of Carrefour and Sciences Po graduate from the Class of 1994) is the largest in the history of Sciences Po. Directed at individuals and companies both in France and internationally, the campaign aims to assist Sciences Po in its ambition to reinvent itself for future generations. The campaign will run until 2022, coinciding with Sciences Po’s 150th anniversary and the inauguration of the new Parisian campus at the historic site of the Hôtel de l’Artillerie. Paris, 8 October 2018: at its annual Gala Dinner, Sciences Po announced its ambition of raising 100 million euros between now and 2022, the greatest fundraising campaign in the university’s history. A first phase has already drawn 47 million euros from businesses and donors since 2015 (39 million collected and 8 million pledged). The Sciences Po 2022 campaign will come to a close at the end of four years, in time for the inauguration of the Artillerie site and Sciences Po’s 150th anniversary. Funds collected through the campaign will enable Sciences Po to project itself into a new 150-year plan, founded on its belief in excellence and innovation, and aiming to affirm its status as one of the finest universities worldwide in the field of the social sciences. As such, the project is faithful to the principles articulated by Sciences Po’s founder Émile Boutmy, who pledged that the school would “shape free minds, capable of understanding the world in order to transform it”. The building of a new urban campus on the historic site of the Artillerie: this new iconic site, which is to be both sustainable and fully accessible, will gather together researchers and students in innovative spaces at the heart of the city, providing the setting for a new and reinvented Sciences Po. Reaffirming Sciences Po’s commitment to welcoming the most diverse talents: funds raised will help Sciences Po continue to develop its policy of equal opportunity, first begun over 15 years ago with the widening of the university’s access to audiences previously excluded from it (high school students from disadvantaged areas of France, disabled students, and refugees). Today more than 30% of Sciences Po students benefit from financial aid. The institution is also firmly engaged in issues of gender equality, implementing initiatives such as a recently appointed Women in Business Chair. Broadening the field of disciplines at Sciences Po by linking our expertise in the humanities and social sciences to the study of life sciences and hard science, so as to provide a comprehensive understanding of the most complex questions facing the contemporary world. New teaching programmes are to be created in partnership with other leading institutions across all scientific domains, as well as new research and teaching chairs. Expanding Sciences Po’s global presence, with a focus on Africa, particularly through the provision of an ambitious programme of academic scholarships and mobility grants. Further plans to develop additional strategic partnerships with leading universities and new dual degrees are in process. Educating a responsible generation, via a multiplicity of engagement opportunities, such as the Civic Learning Programme (FR), launched in April 2018, which makes commitment to a civic or charitable initiative a compulsory component of the Bachelor’s degree. In making this fundraising bid, Sciences Po is building on a long tradition of sponsorship. It was ultimately thanks to the contributions of a circle of patrons and funders that Émile Boutmy was able to found in 1872 l’École libre des sciences politiques, which would become Sciences Po. It was with the help of a donation from the Duchess of Galliera that the university purchased its first building located at 27 rue Saint-Guillaume, in 1879. Sciences Po began forging partnerships and actively fundraising in the 2000s, establishing networks with both Great Britain and the United States. Over the period from 2008-2013, the university’s first fundraising campaign drew 40 million euros, of which 10 million came from international donations. Sciences Po relies on the development of its personal resources: today, public donations represent 37% of the institution’s funds. Sponsorship plays an essential role in assisting the university to fund its projects and strategies; in 2018, 9% of its budget was contributed by sponsors. The Sciences Po 2022 campaign is thus a further diversification of the institution’s economic model, which will allow Sciences Po to reaffirm the support of its existing sponsors, while extending its network still further, particularly towards individual donors. Supporters of this exceptional fundraising bid will be invited to play an active part within the Sciences Po 2022 project: as well as the naming of spaces on the Artillerie site, they will have the opportunity to be involved in key moments of academic and student life, and to share their experiences with a new generation. Benoit d’Angelin, President & Founder, Angelin & Co.